When you think about TV Disposal the first thing that comes to mind is the skip, but this isn’t always the best or even the easiest option. So here are a few ideas and links to make it easier to dispose of your TV in Chorlton and Manchester. Does the TV work? Then find it a new home! First things first, does the TV work. If it does then you have two choices, use it in another room or give it to a charity shop. Even that old “CRT TV” with the giant back end, could still find a home second hand. Finding a charity shop that can take “mains powered electricals” isn’t always easy. At least one person has to be able to “PAT Test” a TV to check that it is safe to sell, and that can be an expensive course to pay for volunteers to go on. “When these items are sold second-hand, government Regulations now require that they’re tested for safety before being put on sale” If you want to read more click here. So which stores can take your TV to? Near our shore there are seven charity shops within a five minute walk, so in Chorlton there isn’t exactly a shortage of choice. However only two are dedicated to furniture. Those two are Sue Ryder and the Red cross. Both advertise that the take electricals, both stores can collect items and both support good causes and you know they are going to a good home. If it’s only a few years old then sell it! Places like cash converters make quite a living out of TV’s, and if you can bring it in to a store you might get a little bit of money for your set. Plus if they don’t want it you already have it in your car and can drop it off at your local charity shop. You could also sell it privately with sites like gum tree and ebay. It might take a bit longer but you could get a little more money out of it, especially on a new-ish set. Options for TV Disposal if the TV doesn’t work? Once again we go back to charity shops, I know the idea of donating broken items seems odd, but hear me out! With more modern sets (a.k.a flat screens) charity shops can actually make some money recycling them, damaged clothes get sold by weight and it’s a very similar idea for electricals. TV disposal can in fact make rather than cost them money. I know during my time at “Extra-Care” that we would have white bags full of broken parts. These would be collected every few weeks and we would get paid by the pound. It’s often not much, but it can save you a trip to the skip and it gives a little money to the store (though it’s often better to phone and ask if you want to donate something you know is broken). 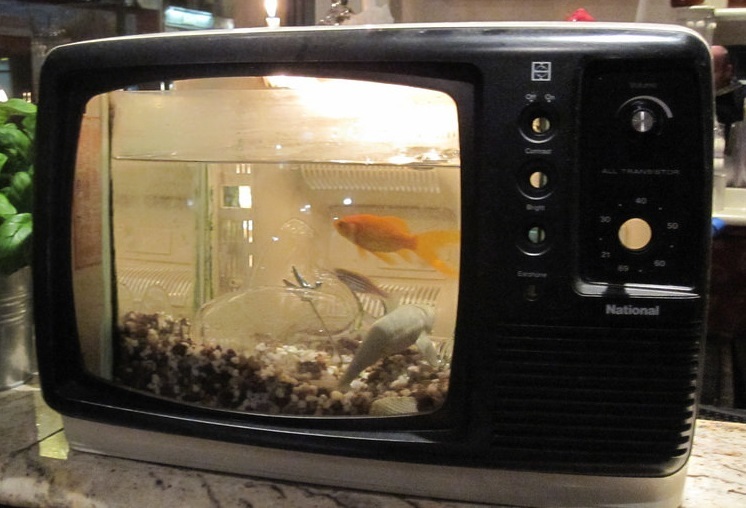 Turn it into a Fish Tank! When all else fails there is always the council. Did you know that once a year the council will come and collect up to 3 large items for free? After that they will charge for collection but if you have a few things that need to be gotten rid of it can be a life saver. For more information about that click here: But if you just want to drop it off enter your postcode here for access to your nearest TV Disposal and recycling site. We hope this has given you some ideas for your old set. But if you ever need a new one then you know where to find us!